I love cloth diapering! We're saving lots of money, and I'm ALL about that. It's not difficult (we don't have a service-just throw them in the washer! ), and it's great for the planet that everyone's so worried about. We are saving over 2 tons of non-degrading waste by cloth diapering! Feel free to read more about the environmental virtues of cloth diapering here. Now, the fun part, is that cloth diapers are no longer boring! Mother-Ease Cloth Diapers gives you so many fun choices in covers. Pictured here, you see Noel in his zoo print Air Flow Snap Cover. Underneath, is a Sandy's Diaper! I love these! They're so soft and roomy. This system doesn't get all hot like the old rubber pants people MY age used to wear (when we were babies, you goofballs!). The terry-cloth wicks away moisture, and as the name might give away, the cover allows air to flow, so diaper rash is minimal! I also have a Mother-Ease One Size, which fits a baby from 8-35 lbs. Talk about a bang for your buck. We've been using one size cloths since Noel was born, and have only spent money on the initial investment of the diapers (around $120). In case you're interested, our water bill has gone up about $5 since we had a baby, but we do a lot more laundry now in general, so washing the diapers has really been a minimal cost. 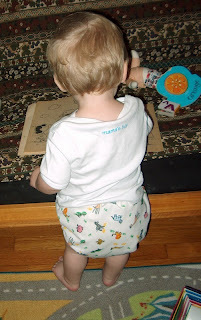 If you're interested in getting started using cloth diapers, check out Mother-Ease! They have an introductory offer that will get you hooked! If you have any questions about cloth diapering, email me: laura@mumsthewurd.com! I'll be glad to answer your questions! After you've hit up Mother-Ease, because I've convinced you to join the cloth diaper world, enter these contests! FREE STUFF! Woo-hoo!